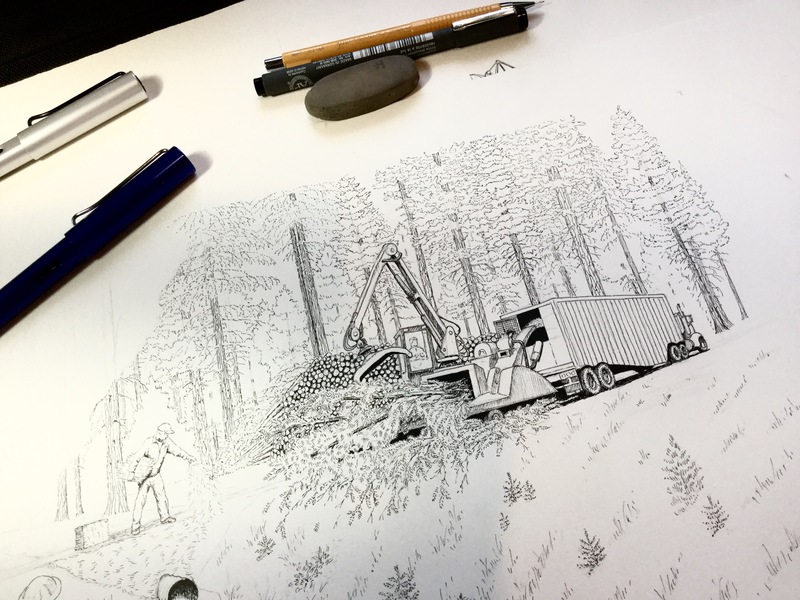 Pen and ink from “Timber”, the cleanup part of the logging operation. The chipper chips the tree tops. Straw mulch to cover the bare soil. This entry was posted in Forestry, Pen and Ink and tagged children's book, drawing, Forester Artist, forestry, logging, pen and ink, Pen drawing, timber by foresterartist. Bookmark the permalink. You captured the mulching job and seedlings too. Beautifully done. In front of my house timber was thinned and branches strewn about to cover the bare soil. I would have preferred mulch. Personally, I think it looks like a tornado came through, although I know it will rot eventually. My husband and I plan to tidy up what is beside our driveway some. Wildlife approved the finished product. I wouldn’t hesitate to tidy up. after the first winter the soils are pretty well stabilized and cleaning up the slash should be no problem. We use slash for mulch all the time in the woods. Very nice drawing. It definitely gives you the flavor of the operation. I’m glad to hear that Ruth. That’s my goal. In Opal Whitely’s diary from the logging camps of Oregon in the early 20th century, she talks about “The Dinky engine” going up and down the results. She was six years old when she wrote this. I have always wondered if this was the actual name of a machine, or simply what she called it. Can you help? It was a tiny 0-4-0 steam engine used for logging railroads or for moving rail cars around at the mill. The 0-4-0 refers to the wheel configuration front-middle-rear wheels. Also called the Porter Dinky. Porter was the company that built the locomotives. I’ve always been interested in how the old timers got things done. It comes with the job. We conduct an archaeological survey and report before harvesting. It is important for us to understand how they used to do things in order to interpret what happened at a site. If we find a significant arch site it gets protected during the harvest. It’s basically detective work. I find it all very interesting. I’m fan ! Your drawings are gorgeous ! Another amazing piece!!! Nice work!